They’re clearly harking back to the black and white images that were done for the original series – you can see a Rorschach one that I posted here a few months back. While that’s clearly Rorschach’s journal Batman’s reading, I can’t see how they could justify the character himself appearing. He’s dead on the Watchmen Earth so why would Dr Manhattan bring him back? Unless of course someone other than Manhattan were to bring him back . . . but that makes no sense either. All will be revealed from November onwards, I guess. 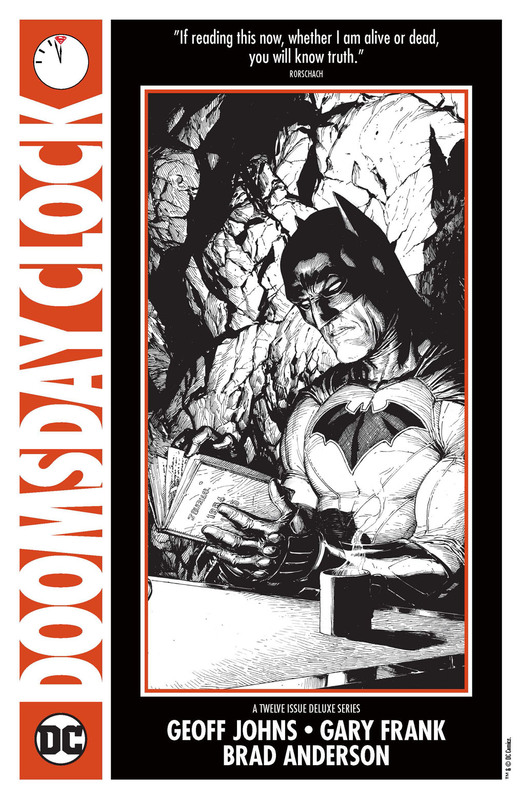 Posted on Wednesday, September 6, 2017 Tuesday, September 5, 2017 by GaryPosted in NewsTagged Batman, Doomsday Clock. The only thing reading Rorschach’s journal will accomplish is giving Batman insight into Dr. Manhattan and the world of the Watchman, enough to help his buddy Superman out when he encounters Dr. Manhattan. Agreed – although that picture does beg the question who is giving Batman the journal? It’s unlikely to be Manhattan – he gains nothing from it – but who else could do that? Someone from the DCU side? Captain Atom?! He is Manhattan’s equivalent, after all! But then they’d have to explain how he got it, and his current DC Rebirth timeline is all over the place. You do raise a good question as to how Batman received the journal and WHO gave it to him. I guess they could always use Wally West again, since he’s the one that introduced the Comedian’s pin to the DCU, but that would be stretching credibility and logic a good bit. Whoever did give Bats the journal, I hope is a person that would make sense. I know Nite Owl and Silk Spectre were left alive and well at the end of Watchmen. Maybe them? They’re the only survivors of the main cast we haven’t seen or heard from yet. Atom’s been shown to travel the multiverse before now – heading over to the Wildstorm Universe for Armageddon, for example. How he gets the journal and why he gives it to Batman? Who knows! It would be a nice symmetry, though, having Atom plant clues/advice pointing toward Manhattan. I’m clutching at straws here! Ha ha, no, your guess, anybody’s guess, is as good as mine at this point in the game. But yeah, Captain Atom being the culprit would be a bit of nice symmetry. Wonder if they’re going to eventually meet and fight.